Our research seminar at State Archives & Records NSW is only one week away! Have you booked your ticket yet? Join RAHS President Christine Yeats, Associate Professor and RAHS Senior Vice President Carol Liston AO, RAHS Treasurer Dr Kathrine Reynolds and Exhibitions Curator at NSW State Archives & Records Dr Penny Stannard for this research focused seminar at Kingswood. Land Titles Records: Carol Liston will provide advice and guidance to assist researchers in accessing and using the historically significant records that Land and Property Information is making available through its SIX Portal – the official source of NSW geospatial information which also provides access to authoritative land and property information. Convict women to NSW 1801–36 and Maintaining Large Numbers of Records: Kathrine Reynolds will discuss how to organise, maintain and recover large volumes of records within the context of the project that she and Carol Liston are currently undertaking. This involves investigating convict women transported from England in 1801–36 using various jurisdictions, including Old Bailey Online and Assizes, comparing the women’s lives pre-conviction and in Australia. 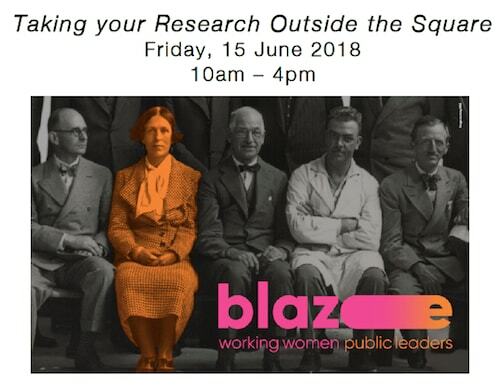 Women and Leadership: Then and Now: Dr Penny Stannard will provide an overview of State Archives & Records’ current exhibition, Blaze: Working Women, Public Leaders, focusing on the research and curatorial approaches involved in situating history within contemporary discussions. A selection of case studies of the women featured in the exhibition will be highlighted. Getting the most from Trove’s Government Gazettes and Journals: Trove is so much more than newspapers – it brings together resources and content from various institutions across Australia that can be searched under one umbrella. Christine Yeats will advise on how to get the most from the Government Gazettes and Journals that are available on Trove. The full program is available for download.